The Latina Book Club is proud to welcome back author Thelma T. Reyna, newly named Poet Laureate of the Altadena Library District. We’d also like to congratulate Thelma on her new poetry collection. We want to hear all about its debut in Italy. Read on! 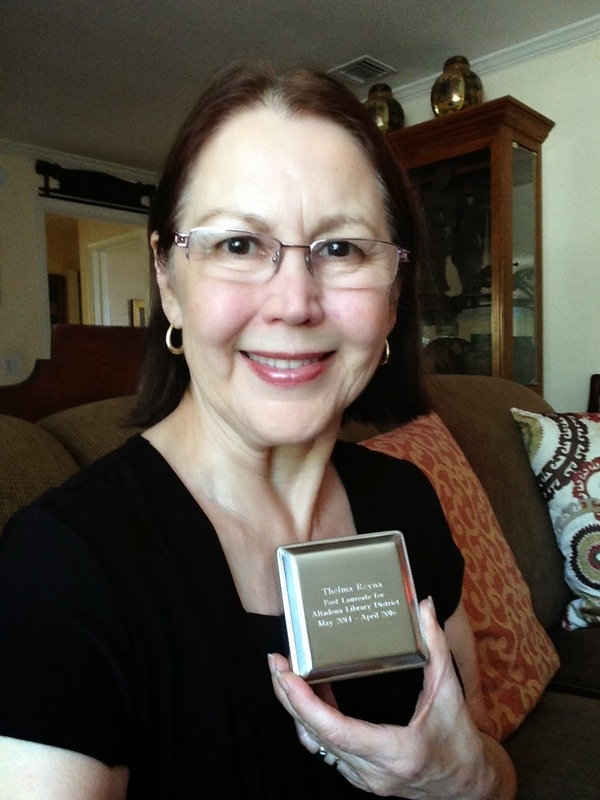 Thelma T. Reyna with her Poet Laureate Award Box. Q: Congratulations on being selected Poet Laureate. Tell us about this honor and how it has changed your life. Thank you, Maria. I don’t know how long the Altadena Library District has had a Poet Laureate, but this year I decided to answer a call for applications. Once chosen, I was surprised to learn that 12 poets had applied! It was pretty competitive, with a detailed application form. We also had to submit five poems, a bibliography of our publications or a resume, and a description of how we’re active in the community regarding poetry and literary events. A select committee reviewed all the applications and made their choice. In retrospect, especially knowing who other candidates were, I’m especially humbled and pleased to have been selected. I was chosen about three months ago. My appointment is from 2014-2016, so I’m not in full swing yet. It has changed my life so far in that it is providing me with a stronger platform on which to interact with my fellow poets, and to talk about my own work. I’m confident that, as time passes, being a Poet Laureate will have more of an impact on my work and activities. I also look forward to having a positive impact, no matter how small, on fellow poets. Q: We understand one of your new duties as Poet Laureate is to promote other regional poets. Can you tell us more about these poets and how you are promoting them? What other duties are required for this new "job"? It’s an honorary position, not a paid one, so this provides great flexibility in how I do this work. Right off the bat, one of my major responsibilities is to lead/edit the annual Poetry & Cookies anthology, now in its 14th year, since the person who had been in charge has retired. So next week I’m meeting with 7 active local poets whom I’ve invited to serve on an editorial board with me. We’ll issue the new anthology in Spring 2015. I’m fortunate to personally know numerous poets in the region, almost all of them published writers and a very diverse group: folks of different ethnicities, men and women, young, Baby Boomers, etc. Several of these poets are prominent nationally and have won literary awards. I plan to stage events with different themes and invite specific poets to read, serve on panel discussions, visit classrooms, etc. I’m also interested in partnering with other Poet Laureates in California and having joint events with their constituencies and mine. I’ve done readings in art galleries, libraries, bookstores, coffee shops, literary conferences, classrooms, book clubs, senior centers, and so on; so I like using diverse venues for presenting poetry. So the opportunity for these poets’ visibility and, hopefully, book sales, is enhanced. Q: You also have a new poetry book out. Tell us about the theme of this new collection and the message you are striving to convey to your many readers. My fourth book, published last month, is my first full-length poetry work. It’s titled Rising, Falling, All of Us, and includes most of the poems from my two chapbooks—Breath & Bone (2011) and Hearts in Common (2013). It also contains poems published elsewhere—anthologies, textbooks, literary journals—as well as some brand-new ones. 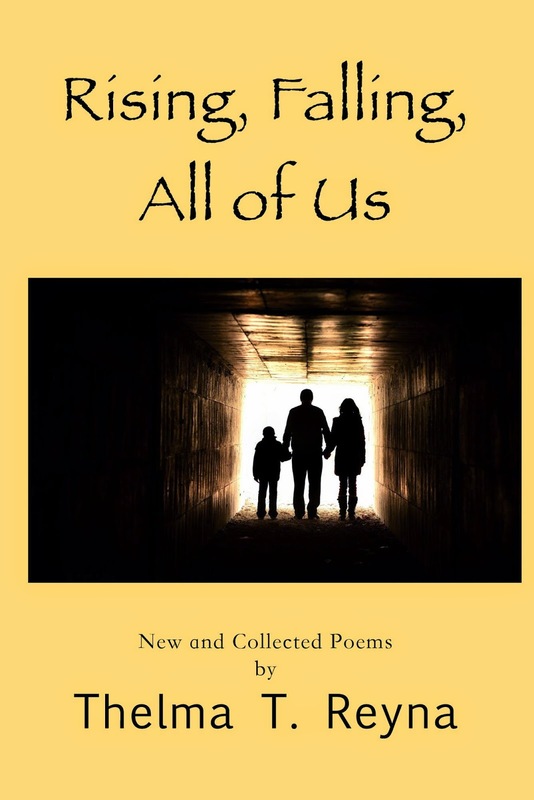 The book is divided into three parts: “Rising,” “Falling,” and “All of Us.” Almost every poem is a “persona poem,” or poem focused on a person, with the person “speaking” to us in his or her distinct “voice.” So the book is mostly a gallery of characters: famous, infamous, real, fictional, mythical. It includes Pope Francis, celebrities, soldiers, killers, mothers, lovers, poets, crazy people, artists, immigrants, etc. The “glue” holding all of them together in my book is my belief that we all rise and fall together in life. People who rise in glory will someday fall, for whatever reason. When people fall, we all fall to some degree. Such is life. The issues faced in my book are those we all deal with regularly, such as love, death, loss, victory, war, ethics, poverty, loyalty. Ultimately, despite our individual differences, we are all alike. That’s the message behind my title. Q: As an author of both poetry and fiction, tell us your favorite genre. Which medium do you find the most passionate? The most powerful? I love short fiction and poetry equally, though short fiction is more challenging to write. My first book—The Heavens Weep for Us and Other Stories (2009)—won 4 national awards. It was a welcome jolt to my writing career, and I’m fond of that book. I’m inspired by my daily surroundings and interactions, and each new inspiration almost tells me what form it requires: a poem, a story…or an essay. (I have also published nonfiction in my career, though not as a single book.) The passion or the power of writing doesn’t depend upon its genre but upon how it’s written. So regardless of what genre I write, it’s up to me, in how I shape it, to infuse it with passion or power…hopefully both. Q: We heard you had a poetry reading in Lake Como, Italy. That is a long way to go to give a reading. How did that come about? And tell us about the Pulitzer Prize winners in your audience. It was actually a week-long international writers’ event called “Abroad Writers Conference,” or AWC (http://abroadwritersconference.com/). [On this link, scroll down to “Lake Como, Italy” to see photos and learn more.] I was invited to participate by one of my publishers, Finishing Line Press, a co-sponsor of the Lake Como event. There were about 50 of us published authors from all over the United States, Australia, and Italy. Each one of us enrolled in either one, or two, intensive 15-hour workshops on different topics taught by Pultizer Prize winning authors and other top national award winning writers from America. I was in a Poetry Workshop with Pulitzer winner Rae Armantrout; and in a Fiction Workshop with Pulitzer Prize winning novelist, Jane Smiley. I believe I was the only Latino/a in the entire conference. Our workshop groups were small (7 authors in each of mine), so we received a lot of personalized attention and advice from our author-teachers. We received great critiques, not just from the “faculty,” as these famous authors were called, but by our workshop colleagues. The level of skills and professionalism of all the attendees was quite high, so their critiques and discussions of each other’s work were outstanding. We all came away, I believe, as stronger writers. Plus, Lake Como and the 18th century Villa Galliata we stayed in and workshopped in are both gorgeous. It was an experience of a lifetime. Q: How can your fans learn more about your books, and learn more about the poets you are promoting? Please list your websites and addresses on social media sites.